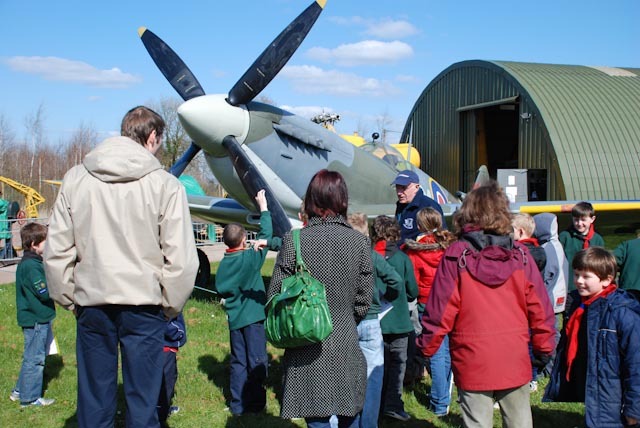 Both school parties and other groups are very welcome to visit the Aeropark however these must be booked in advance with the Aeropark Volunteers Association. Visits to the Aeropark for groups of all types can be arranged and the content and duration are agreed based on the group's own requirements. The visits are conducted by AVA members who are all volunteers and have a wide range of aviation experience and knowledge and depending upon the requirements and obejective of the group's visit we will try to match the volunteers to meet the groups requirements. For visits including children we provide work books which contain activities which are done whilst on site at the Aeropark and can then be used after the visit on any follow up work which is done based on the visit. A copy of these work books can be provided at the booking time along with our generic risk assesment. All school groups are given special treatment and a full guided tour by AVA volunteers, there is a charge of £4.00 per supervising adult and £2.50 per child.There is a minimum charge of £25 per group in order to cover costs, and we ask that this minimum charge is paid prior to the visit and the balance paid during the visit. This is the only official location for information relating to the Aeropark and AVA, we have no control over postings which are made elsewhere nor can we vouch for the honesty, truthfulness, authenticity or accuracy of such.